Hey guys, name's Nate! I've been lurking the forums the past few weeks, and have been on the hunt for a specific bus: Flat face, under 29ft total length, with DT466 or 5.9L Cummins, and around 150+ square feet of usable space. This has been a rather difficult search, as its a rare combo, especially finding one in good shape. Well, I think I might have finally found one! Asking price: $8,000. The owner has stated they've received multiple offers for $5,000 and have turned them down. - Has had Cummins Campaign 0504 Bulletin # 4907663 performed (Upgraded LP). - Rear seal replaced 1.5K miles ago, new trans seals and other seals accomplished when this took place. Paint: Repainted when they took ownership from city bus auction. I'll be turning this into a full-time off-grid skoolie, moving myself and my two 90lb Labs into it within the next year. My reason for going with a compact bus is so I can travel and use it at 84% of national parks (Source: https://camperreport.com/best-rv-len...ational-parks/). This has nice, big windows already, and the floor is FLAT, so no worries about working around wheel wells in my floorplan. It's also the right height, as I'm about 5'9" and even with floor and roof additions I should have enough room to stand comfortably. Ground clearance may be an issue, but only if I have to ascend some crazy steep roadways. One more thing, does anyone here know about the Blue Bird CS/APC series buses? I can't find many examples of anyone converting one, so I'm slightly hesitant of diving into the unknown. Looking forward to feedback and expertise from everyone! I'd pass. Its top dollar for a lowrider with a 545. And that's crazy miles for a 5.9 in a bus. If you've got that kind of dough go for a top of the line bus. No way I would personally pay that kind of money for that drive train, especially with over 300K on it. Keep looking, what you want can be had for around $3k if you search. You may have to travel a bit to get the right one. I pity those who settle for less just because it's close. There are much better deals than that out there. It may take some patience. 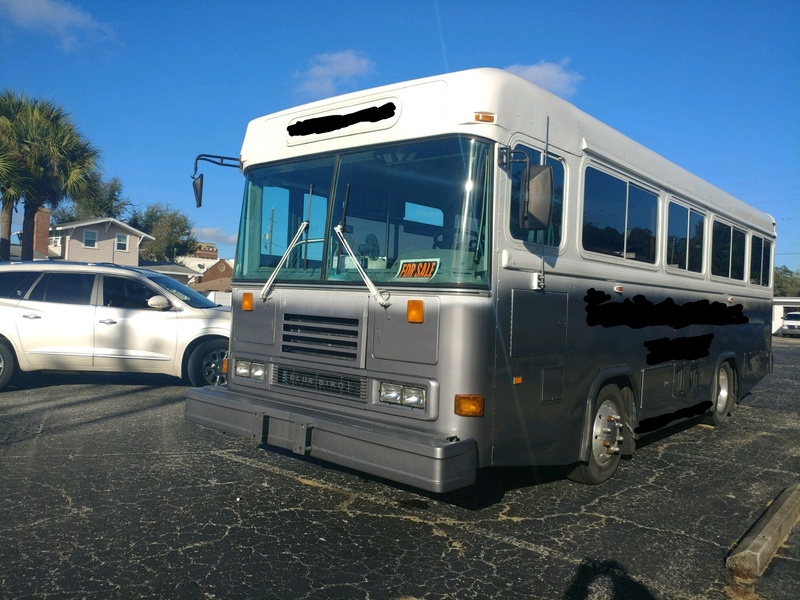 I actively looked and bid on auctions for almost 18 months before I found my 8.3/MD3060 equipped bus with 180k miles for $3800 including auction fees. A little patience will pay dividends in your search. No arguing the price is high, and I likely will offer no more than $6500. I haven't been able to find many other options after searching for a few weeks. Not a flat nose, but an example of what's available. Just happened upon this, I'll keep an eye out for what you want. It’s only an asking price... Offer them something realistic for you and give them the reasons why. It’ll sit there a long time at the current asking price..
suncoast makes a Locking converter for an AT545?? only thing i knew of was suncoast making a "tighter" converter. but a Locking converter requires actuation mechanisms..
price is def high.. its a 300,000 mile engine thats not wet-sleeved.. its a $3500 bus.. They don't make a lockup converter as you would need a valvebody, controller, and input shaft. Suncoast does make a torque converter with higher efficiency though. It might not be on their website, so I would call and check with them. - Less than 29ft long, but not a shorty <<<This is most important, since I want to fit into a majority of National Park campsites, while still maximizing the space I'll have for full time living. This community has already provided me with a wealth of information, and I'm incredibly appreciative... Thank y'all so much! I had/have the same concerns as yourself regarding national parks. That's the entire reason for my project. RVs up to 12′ in length fit in every national park campground in the United States, although there are a few campgrounds that don’t allow RVs at all and are tent only. RVs up to 19′ in length fit in 98% of all national park service campgrounds. Without the front buttwacker, mine comes in at just over 32', entirely passable in the 32 foot areas. I'm not sure if this is a secondary goal, but I can confirm that anything under 35' can fit into two lateral parking spaces fully within the lines. As for your bus choice, that was mine as well! I love the little TC2000's, so cute. I had several floorplans designed in sketchup, and they were great. In the end though, I decided to settle on something a bit larger at the expense of losing roughly 3% of parking areas. Entirely worth it IMO. The AT545 isn't great and with the TC's small wheels, handling and speed won't be very good. As others have said, the AT545 makes for rough driving when it comes to going up/down hills. I originally would never have picked a dog nose, but after test driving some transits and dognoses, I found that my preference for handling heavily weighed in and I decided to take a middleman, the Vista. Half dognose, half of the engine is in the cab under a short doghouse. I lose 3 feet, but it drives like a standard vehicle with the driver behind the front wheels. If you get the chance, drive a few of them. School districts often will take you on a ridealong if you can't find a dealership that'll let you do a test drive. The transit styles put you over the front wheel, and due to leverage any bumps will be magnified. My rear end hurt a bit after only 20 minutes of driving in one (in mildy rural areas, not too bumpy roads, all paved). Turning wasn't bad, but it certainly was different (although you'd get used to it, I did after my first 2 test drives). As for the engine, just my own opinion and coming from a newbie to the skoolie community, but I'd drop the 5.9 off your list of potential engines. The 8.3 and DT466 are highly recommended, but the 5.9 seems to get the consensus of underpowered.